Apep, the first Wolf-Rayet star system to be discovered in the Milky Way. This Wolf-Rayet star system is formally known as 2XMM J160050.7-514245, but to the researchers who recently investigated this enigmatic object, it’s simply “Apep”—an exotic object named for the serpentine ancient Egyptian god of chaos. In a press release, Joseph Callingham, the lead author of the new study and an astronomer at the Netherlands Institute for Radio Astronomy (ASTRON), said “it’s the first such system to be discovered in our own galaxy”—a system he never expected to find “in our own backyard.” The details of this research were published today in Nature Astronomy. Indeed, astronomers have observed Wolf-Rayet stars before, but only in other galaxies. These massive star systems are on the verge of entering into their death throes, at which time they’ll generate a type of supernova that emits an extremely powerful and narrow jet of plasma—the dreaded gamma-ray burst. 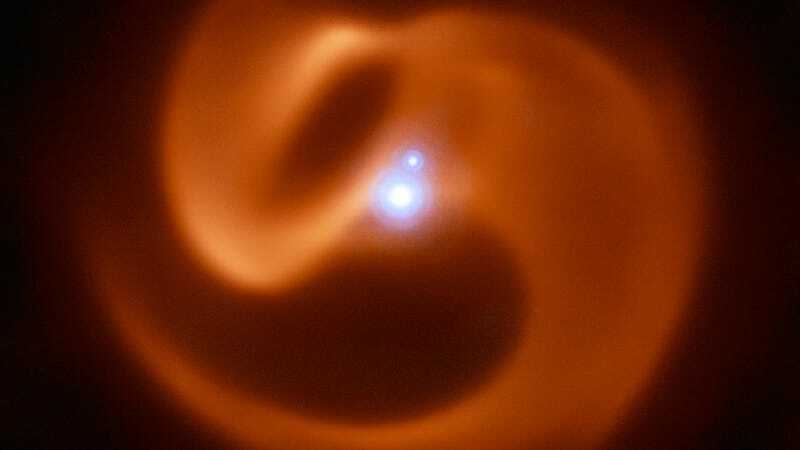 Apep is one such gamma-ray progenitor system, featuring a massive triple star system at its core—a binary pair and a lone star—and vast spiral arms composed of gas and dust. The system is located around 8,000 light-years from Earth, which is uncomfortably close given its explosive potential. Using the VISIR mid-infrared camera on the European Southern Observatory’s Very Large Telescope, Pope, Callingham, and their colleagues measured the velocity of the dust within the spiral arms. 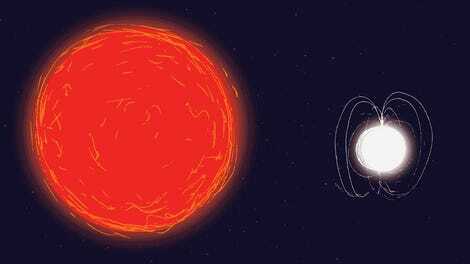 At this end-stage of their brief life cycle (these systems only last a few hundred thousand years—a blink of the eye in cosmological terms), stars within Wolf-Rayet systems spin rapidly, producing stellar winds that move at horrendous speeds. These winds carry significant portions of stellar material into space, and they’re responsible for forming the majestic plumes of dust particles. In the case of Apep, its spiral arms measure several light-years across. By measuring the rotational speeds within this nebula, the researchers concluded that at least one of the three stars within the system is spinning fast enough such that it’ll trigger a long-duration gamma-ray burst when it finally explodes as supernova (the exact timing is still impossible to predict). The speed of gas within the nebula was clocked at 12 million kilometers per hour, but the dust is moving at “just” 570 million kilometers per hour. 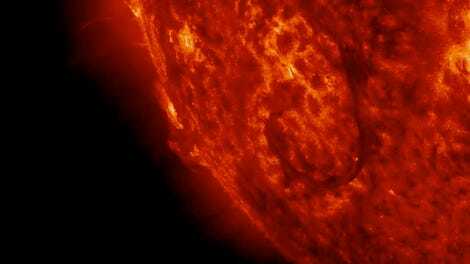 The researchers say this discrepancy is indicative of a star approaching near-critical rotation. Artist’s impression of a gamma-ray burst.